Inspired By True Events - Ohhhhh, the prince is a metaphor for escapism, ohhhhhhhh. 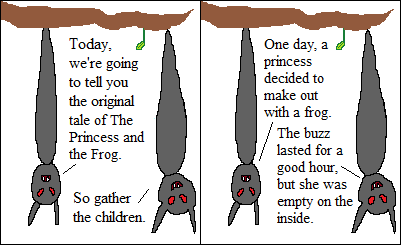 Ohhhhh, the prince is a metaphor for escapism, ohhhhhhhh. That ending was actually kinda sad, but then again, people end up dead a lot in the Theater Bats’ version of things. So maybe it was actually happy.